To Hell and Back programme - thanks! To Hell and Back programme – next week! 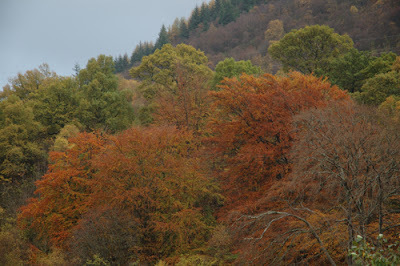 Lovely autumnal woods here in Glen Nevis right now. I took this shot from my living room window! I’ve not been posting here for a wee bit because I’ve been on a work mission, 16/17hours a day since I got back from my lecture tour in front of the screen trying to build Claire’s new website for her new business that we’ll be launching shortly (more on that very soon). Although I’ve built my own sites up into much bigger animals than they were when they started out, at least I had a basic site to start with. This time it’s my first effort building a site from scratch. I’m getting there, but with much abuse of caffeine, less than perfect mood state and depressing loss of fitness. Apologies if you’ve tried to get in touch with me over the past few days, I’ll get round to replying to all my messages shortly. To Hell and Back – Want to see it on BBC2 national? Lots of people commented that they would like to see the To Hell and Back programme on BBC2 national as they couldn’t get BBC2 Scotland or download it off the BBC iPlayer in time. If that’s you, please add a comment to this post with your name to register your feeling. Maybe you live in Scotland and saw it and feel it was good enough that the rest of the UK folks should get a chance to see it? Again please comment below. I’ll flag this post up to the BBC in a few weeks and if enough people comment, maybe it’ll swing it? Thanks to everyone who contacted us after the To Hell and Back programme on BBC2 last week by email, txt, blog comment etc, we appreciate the thought so much. We liked the programme ourselves, although our toes curled when we saw that our tour round our wee Glen Nevis house had made the edit. You know that feeling where you hear the sound of a recording of your own voice and cringe a little? Multiply that by a good few times to get the feeling of watching yourself showing a TV audience around your wee hoose. 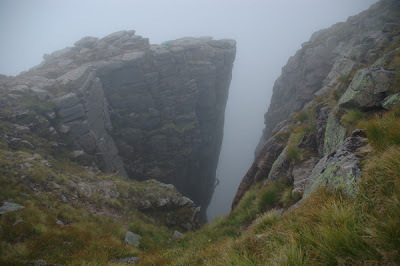 Another comment that folk made was the number of times we were reminded of the consequences of me falling off the route on lead – ‘death’. That word was mentioned many times over. Of course it’s natural that the documentary editors would keep reminding us of this as it creates tension. Of course the former was what actually happened. If you downloaded or taped the programme, watch the footage with the sound off and look out for any wobbles. It would make quite different viewing. Of course it’s necessary for me to look carefully at the potential consequences of failure and analyse the potential for that occurring. So all I’m doing there is taking a serious route seriously. The bottom line is that there is no way I would have been there if I thought I was going to fall. I couldn’t eliminate risk of things going wrong, nor would I want it that way. But my preparation and execution of a solid plan for my approach to the climb kept the danger (just) within an acceptable limit. As the quotes above allude to, films like this make us wonder a lot about risks in life, that’s why they are interesting. To me, it’s simple and clear that some risks in life are utterly essential to get anywhere, whether they are physical, emotional, financial or other types of risk. A live life with no risk at all is not to live – because nothing useful could be accomplished. So the question is not whether to take risks, its whether a given risk is the right risk to take. What we never see in documentaries like To Hell and Back is the flip side of risk – not taking enough risk, and missing out on doing something amazing with your life. Getting to the end of a long life, never having taken a risk (and never accomplishing things you had the potential for) is a WAY bigger tragedy than coming unstuck while taking a risk that was really worth taking. So when Dax said “ever wonder whether you should lift your foot off the accelerator?” I say never, ever lift your foot of accelerator, so long as you are accelerating in the direction that is right for you. 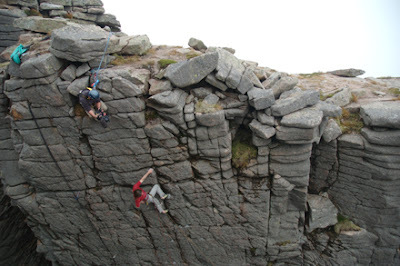 Back in August, a massive team of climbers and production staff including myself gathered on Cairngorm to try and make what would have been an amazing live program of new routing on the cliffs surrounding Loch Avon. 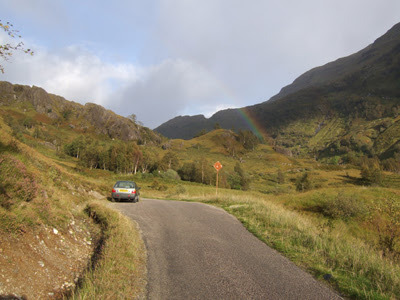 But the huge effort did not pay off because of the deeply frustrating (at times) Scottish weather. It chucked it down all weekend long on the broadcast days. I was all set to attempt something that really scared me silly – a new E10 rock climb with very little protection, live on telly! In retrospect I’m quite exceptionally glad I didn’t have to climb it live, but I still wanted to climb it very much , and wanted something good to come of all the effort that went into The Great Climb programme. So I went back the following week and did the route, with the crew filming. My route, To Hell and Back, E10, was the scariest lead I’ve done in my climbing life and a pretty full on experience for both myself, Claire who was belaying and everyone else who was there, it seemed. We all wondered when the footage would finally be shown on TV. Well, it’s going to be on BBC2 Scotland, next Wednesday (Oct 24th) at 8pm – 9pm. I understand that if you can’t get BBC2 Scotland, you can watch it via sky (if anyone can confirm this or knows of other ways to view BBC2 Scotland around the UK and the world – please comment on this post!). 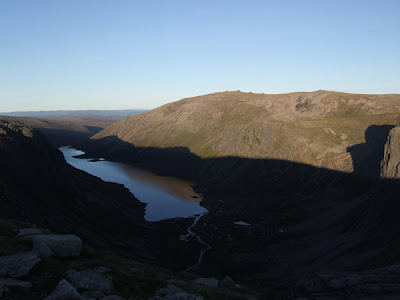 Loch Avon from the top of To Hell and Back; The Cairngorms are a cool place. I haven’t yet seen the film myself, but I imagine it could be a bit full on? My post about leading the route is here and the producer’s view of the experience is here. The past weeks have flown by in a bit of a blur of burning the candle at both ends and in the middle. After writing my book, I just had time to get prepped for my wee lecture tour around Scotland. Coach climbers by day, talk about recent routes by evening, drive to another city by night. Sleep fitted somewhere, I think? I was impressed by Aberdeen’s new wall which I’m certain will bring along some fine climbers in years to come. Tiso did an excellent job of hosting the talks and it’s good to see them running lots of events for climbers when all around, other outdoor retailers seem to be struggling or dying off (if unsurprisingly). After a rendezvous with Dave Brown at Corran Ferry, we finally got our hands on our stock of the Committed film and spent some considerable time stuffing envelopes and packing off the DVDs. I had a lovely day climbing with Ruaridh and Ellen in Glen Nevis showing them the delights of the bouldering there in crisp autumn sunshine as birch trees around us shed their leaves. 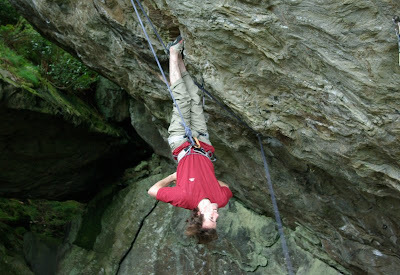 We ended the day climbing near a bouldering project of mine beneath pinnacle ridge, looked at for a long time by several aspirant crimping demons. 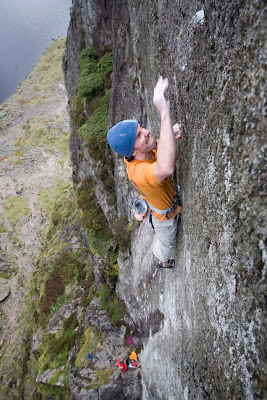 I thought it would be the first Font 8a in the Glen. They asked if I would be having a go as we were there, but I said no I wasn’t in good shape after the days and nights on the road. But of course, I couldn’t resist and went for a quick shot, if only to confirm why I failed to hold the crux swing so many times before. First shot, not really focused, and my legs almost swung back before my grip gave out. Hmmm, another go was in order with more focus. This time I felt I had strength in my body for the first time in ages and held the swing and grunted to the top. As with so many projects, they go much easier without the pressure of expectation. A beautiful little overhanging wall, no longer a project. There are still plenty of spaces left at my lectures and coaching sessions around Scotland next week. Hopefully see you there. I’ll have some good clips to show you of the climbs I’m talking about: my hardest ever link on rock, on a bouldering project, climbing Blind Vision (a clip from the new Committed film) and hopefully some footage from my E10 on Cairngorm To Hell and Back if Triple Echo productions finish the edit in time. I’ve just heard from Hot Aches Productions that delivery of stock of the Committed DVD is delayed by a few days until the 18th. But I’m emailing out copies of my free E-book to orders right now. Kev Shields was on the Scottish TV news last night, see the clip here of Kev soloing E4 and training on his board. 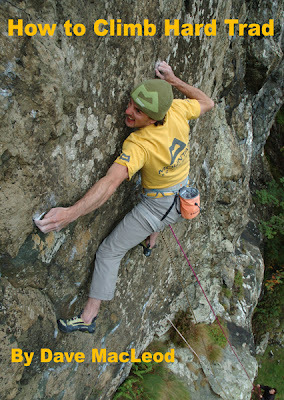 Today I’m releasing my E-book How to Climb Hard Trad which is hot off the Adobe Acrobat press! If you ordered a copy of the Committed DVD from my webshop during the last week, I’m going to begin emailing it out to y’all this evening (it’ll take a while for all the copies to get through my mail server!). 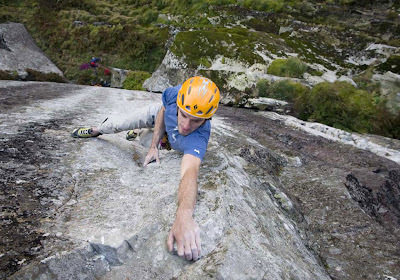 How To Climb Hard trad is a guide to how to get yourself on a path to improvement in trad climbing. I’m giving it away free with orders of the Committed DVD from my site and it’s not available anywhere else. 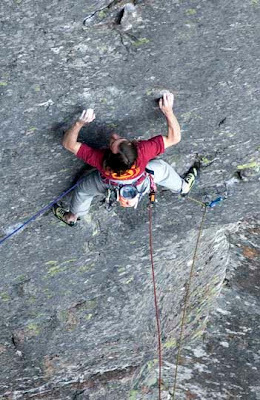 The E-book deals with motivation for trad climbing, how to develop and reinforce it and how it affects your ability to deal with bold climbing. I’ve dealt thoroughly with both the strategic and practical aspects of increasing boldness, confidence and safety, as well as exploding a few myths about bold climbers. 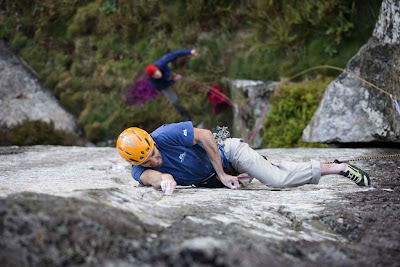 I’ve looked carefully at tactics and approaches to improve your onsight and headpoint climbing and what to do if things go wrong on the sharp end! If you would like to get a copy, just order the Committed DVD from my site (here) and I’ll email it to you when your order comes through, free. It’s in printable PDF format, 42 pages, A4. It’s been a crazy few weeks with my laptop taking a hammering at every waking moment to get it all finished in time for the Committed film coming out. I hope it helps you with your climbing. Shaking out on the Anvil project. I get about a minute before my toes are screaming ‘enough!’. Photo: Dave Redpath. More photos of the Anvil on Dave’s Blog. After two more sessions on the big project on the Anvil roof with Malc, Is suspect my body is beginning to adapt to overhanging climbing again. Not that it feels it since that project is so damn hard. I can pretty much cruise to the start of the crux, but a major setback was Malc’s steel fingers ripping off the crux edge last week – doh! The crux 4 moves were about Font 7c+, but now they feel more like solid 8a to me and a bit more reachy. Right now I’m totally stumped (unlike Malc who is looking in very good shape on it). But I’ll keep trying. Anvil days are so good for fitness and for making you feel weak and psyched to train. Two more days of sunshine before the September High slipped away, and two psyched climbing companions to go with. It was an easy decision to get back on the M6 south to the lakes for two more days of getting in the big Birkett routes. Several deadlines were being stretched as usual though, and after the usual 2am finish in the office (in this case to get all the coding sorted out for handling Committed DVD orders from my webshop – available now!) I hopped on the dawn bus south and met Steven Gordon and man of the moment Kev Shields. 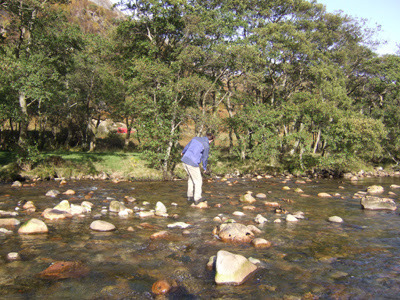 The warm sunshine lifted our psyche level although the traffic jams quickly cancelled this out. I think I’m settling a little too quickly into Highland life?! By 1.30pm we jumped out of the car on top of the Honister Pass and headed for Gillercombe Buttress and Birkett’s ‘other’ big unrepeated line Caution E8 6c. In Set in Stone, Birkett tells us that “Caution and If Six Was Nine are harder than anything else I’ve done”. Among the shots of the amazing smooth leaning wall of Caution, Dave also tells us that if he was a newcomer to the UK “it would be the route I’d most want to do in England”. Hence motivation levels were ‘high to hyperactive’ to experience the climb for myself. Last Friday I had my first session on it by myself in a bitter easterly gale. Linking the crux with numb extremities but still wearing my duvet jacket felt encouraging for getting on the lead on the second day. This time a cool light breeze whistled over the Sunkist Lakeland mountains and all felt very positive. On my lead my mind was silent, as I normally choose as my mental strategy. All I felt was the perfect friction of the crimps under my fingers, the flow on an exquisite sequence of moves. It was a ‘pinch yourself’ moment for me in my climbing life – feeling strong, athletic and confident in a situation that I know would previously have scared the living daylights out of me. I want to have as much of that feeling as possible! The grade – confirmed E8 6c. No harder as has been suggested, but certainly no easier. After recent tolerance training, I was able to drink two and a half celebratory pints of lager in Keswick afterwards without feeling ill, my best effort in maybe three years. My all time low was the day I did Rhapsody which necessitated staggering home and much tea after just 1.5 pints. We even managed to rise at 6am the next morning and sweat it up to Pavey Ark to look at Impact day E9 6c. 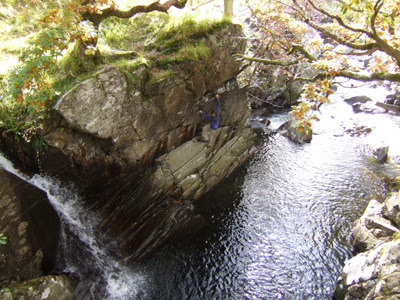 I’d spent an hour dangling on this a couple of weeks back but the bottom half was soaking. A little font was still dribbling water down the lower wall, but a T-shirt bung soon sorted that out and a couple of hours later I was breathing hard on the lead, grunting through the crux moves. Much safer than Caution, this route is about having the juice left at the top to pull on some fairly small holds (E8 rather than E9 I think). The suspense keeps you psyched right to the last until you get past a mono and a big move into the scoop at the end. The silence of the mountain was broken only by my hard breathing, Steven’s shutter firing off just a few feet away and the distant cries of the Langdale farmers gathering the sheep and taking them down off the high fells for winter.